The last days of school aren’t always the easiest when it comes to thinking of engaging and meaningful activities. Here are 5 ways to keep your students thinking and working hard until the very end. My students and I talk a lot about the power of feedback in the learning process, and that goes for teachers as well (here’s an article I wrote a little while back about purposeful feedback). I spend about 15 minutes of the last day getting students to fill out a survey about the year. Here is a link to the survey I use. I keep the survey anonymous and ask students to be as honest and specific as possible. My students have consistently risen to the occasion and provided me with excellent insight, which in turn has made me a better teacher. If you are not familiar with Kahoot!, it is a fast paced web based class quiz game. It is a regular part of my course all year long and I highly recommend it (plus it’s free!). It works great for the last days as a review of the year. Make one with academic questions or create questions about some of the funny things that have happened throughout the year. Students can play in team mode or on their own. One thing is for sure, the students will be engaged and at the same time reviewing the topics you covered over the last 10 months. Frozen Moments is an acting game, where the participants ‘act’ out a scene without moving. 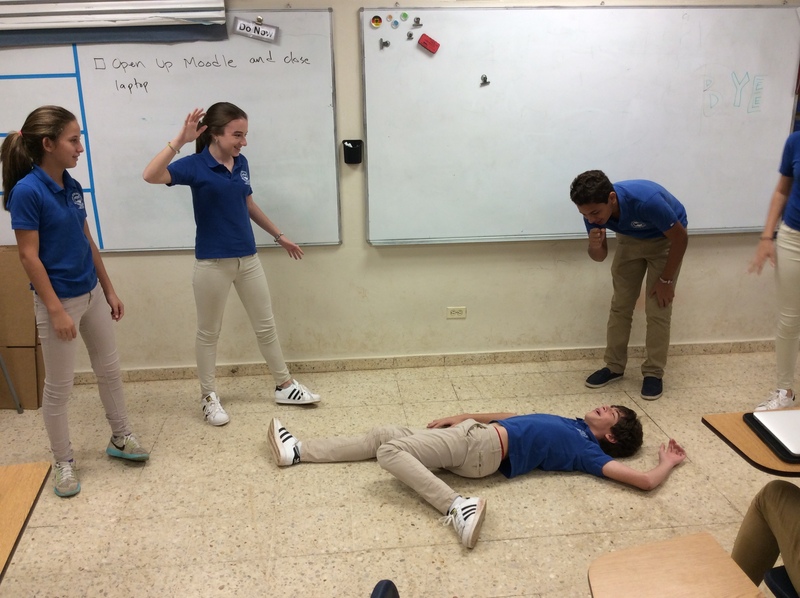 Students have to arrange themselves in a position and use a facial expression that will allow the audience to guess what the scene is about. The actors, when tapped on the shoulder, come to life for just a few seconds to share what the characters are thinking or how they are feeling. I move around the scene and tap each person once, although some clues need to be shared multiple times. The point is for each student to give enough of a clue for the audience to figure it out, without making it too easy. This activity works great to review events from history or important scenes from a book or movie. You can also make it more abstract by acting out different ideas from science or songs from band or choir. It’s great to see the students think back to the beginning and middle parts of the year and bring them back to life. Here is a handout with directions and an organized to help get your students going. The Human Machine is an activity where students have to become the different parts of a simple, or assembly line type, machine. Each person acts out a repetitive motion with a sound, that then connects to the person to their side. Each person adds on until the machine is built. It is great to watch students try to turn more abstract ideas like the water cycle or the 5 Pillars of Islam into a concrete machine. The key to making this activity work is to first practice “making” a simple machine with only motions and sounds not connected to an idea. Then do another one together about a concept that every student understands well. Finally, put them in groups and challenge them to represent the topics you want to review. The game is fun and the students will amaze you with how they put things together. Use this game to review story structure, the scientific process, the concept of supply and demand, or even the stages of the American Revolution or the Bill of Rights. It’s a great way to end the year in an engaging and meaningful way. Here is an example my students did as a review of feudalism (they made it into a pyramid, so clever!!!). Party Quirks is an improv game, and one of my favorite segments on Whose Link is it Anyway? (just Google Party Quirks and Whose Line and prepare to laugh away!). The game is set in a party, where each guest is a predetermined character. Each guest ‘enters’ the party one at a time and the host interacts with the guests to try and figure out who they are. In the show the audience is made aware of the character but for using it in class I like to keep the student audience guessing as well – it keeps them engaged and thinking. Encourage each student to embody the character, whether it be an historical figure, a book character, a term in science (think solid, liquid, gas acting at a party! ), or any other ideas you covered throughout the year. Like Frozen Moments, each actor wants to give enough clues for the audience to guess but doesn’t want it to be obvious. When I use this activity for the first time I usually play the role of the party host – I find I can typically guide students when needed without giving too much away. However, once you have played a few times, give the students the reigns and step aside! This is another great way to hold the students’ attention and keep them thinking to the very end. Each of these five activities is meant to be a meaningful and productive, AND fun and engaging way to end the last days of school. They require little to no materials, are full of deep thinking, and are plenty of fun to keep those almost summer students working hard to the very end. What activities do you use to keep your students engaged and learning on those final days? Please share your ideas below!